Made a map of our walk, starting at the World Trade center at the wharf. 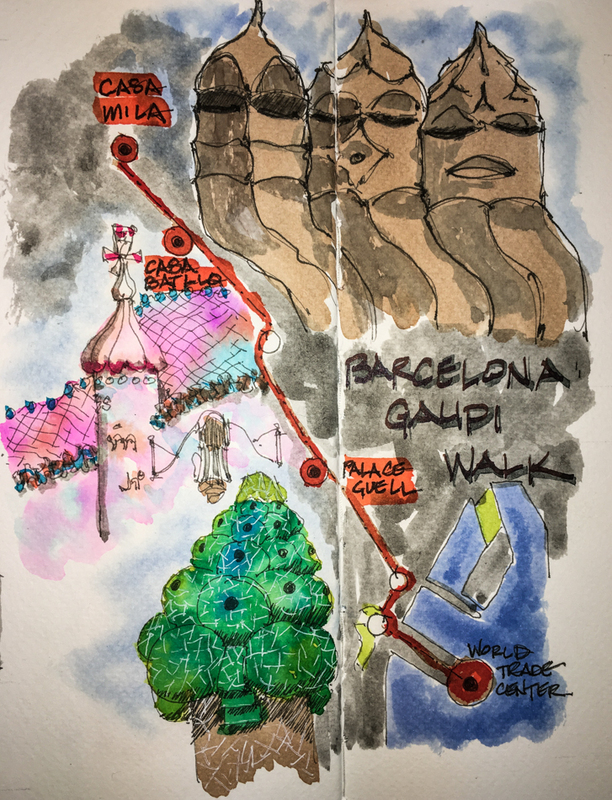 Heading up to the Palace Guell, Casa Batllo, and the Casa Mila! This entry was posted in architecture, art journal, challenge, ink painting, pen & ink, process, virtual sketching, watercolor and tagged Antonio Gaudi, architecture, art journal, Barcelona, Daniel Smith watercolors, De Atramentis Document ink, Fabriano Watercolor journal, Holbein, Lamy Al-Star, Lexington Grey Noodlers ink, M.Graham, maps, Pilot Metropolitan Fountain Pen, Platinum Carbon pen, Platinum Preppy pen, Primatek, Sennelier, Super5 ink, virtual sketchwalk, watercolor, White Uniball Signo. Bookmark the permalink. What a great map you’ve created as a record of your travels. Some time I would love to make a visual journal of my travels. There is just never any free time when we travel at present. Barcelona is certainly an inspirational city for artists. The architecture, the mosaics, the public sculpture, the details everywhere, and of course all of the Gaudi structures are just incredible. I loved Park Guell and the Sagrada Familia. You know that this is a virtual walk, right? 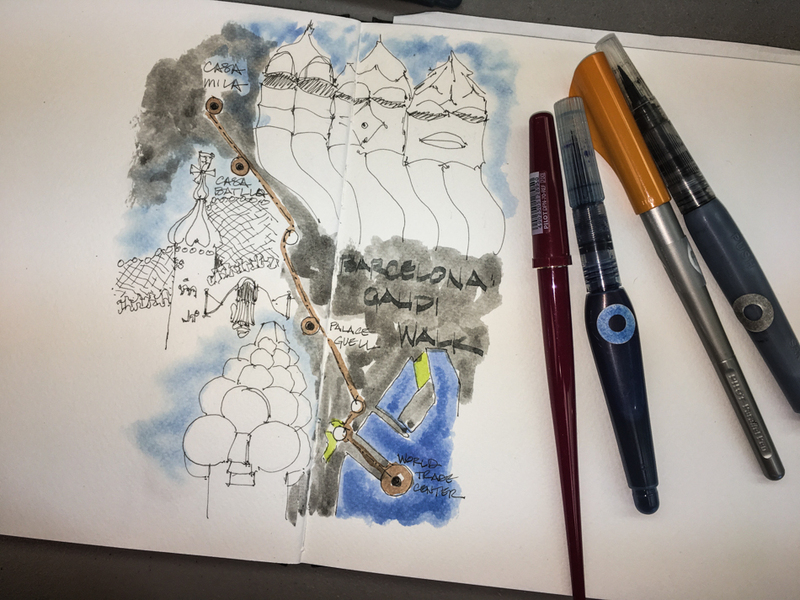 I have traveled to Barcelona but I lead a FB group… Virtual Sketchwalk! And yup, your kids are still a bit young… get them sketching! Ha! No. I’d somehow missed it was virtual. That’s great. A few years ago I did a “magic carpet ride” with my kids where we pretended to fly to different countries, ate food from that country, and learned about the people and culture. Oh how fun! Maybe we should do that one during the holidays, when people re very distracted!